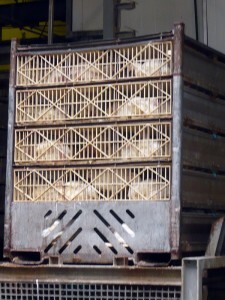 The chickens are 20 to a crate, and the crates are moved in piles of 2 x 5 by a fast-moving forklift truck driver in dark blue overalls and a thick white mask over his mouth and nose. We’re in the (public) lane between the two buildings of the chicken packing factory at the corner of Hastings and Commercial Drive in East Vancouver. The building on the right as we look up the lane is the warehouse where stacks of crates, some 20 or 30 high, are kept in holding. On the left is the slaughterhouse. 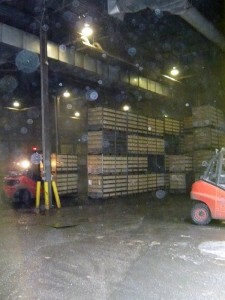 The forklift brings 40 or so crates from the towering columns to the open door of the warehouse, and from here he maintains a steady speed of loading the 2x5s onto the automated conveyor belt on the other side of the lane, into the open end of the slaughterhouse. 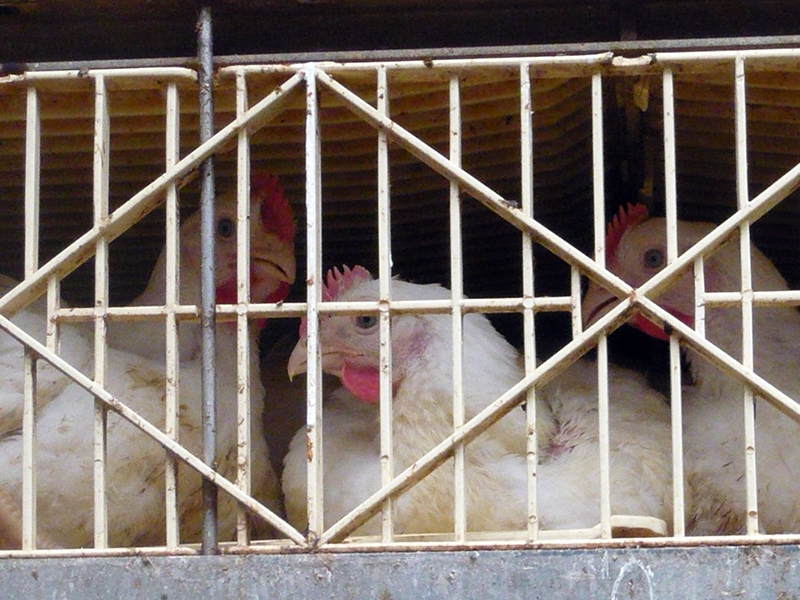 The chickens are now minutes from death. They are 45 days old. “Just babies,” said Mary-chris Staples, a maths teacher and organiser of the weekly vigils outside the slaughterhouse. 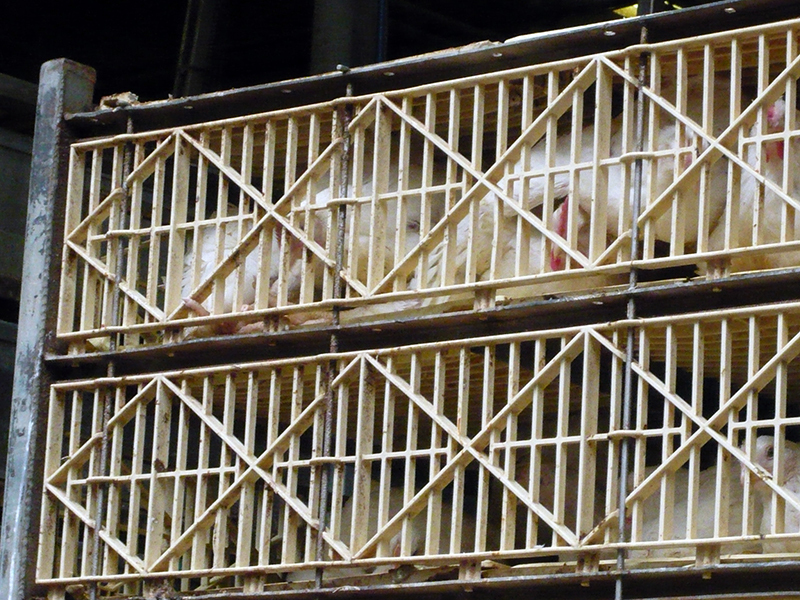 She holds up two fingers to the birds in the crates as they are transported between the two buildings, a victory sign. “Bye babies,” she says as we take their pictures. The thought flashes through my mind that the ultimate sponsor of my trip, Winston Churchill (on this Churchill Fellowship), also used, became famous for, using this V-for-victory sign, long before victory was ever in sight. 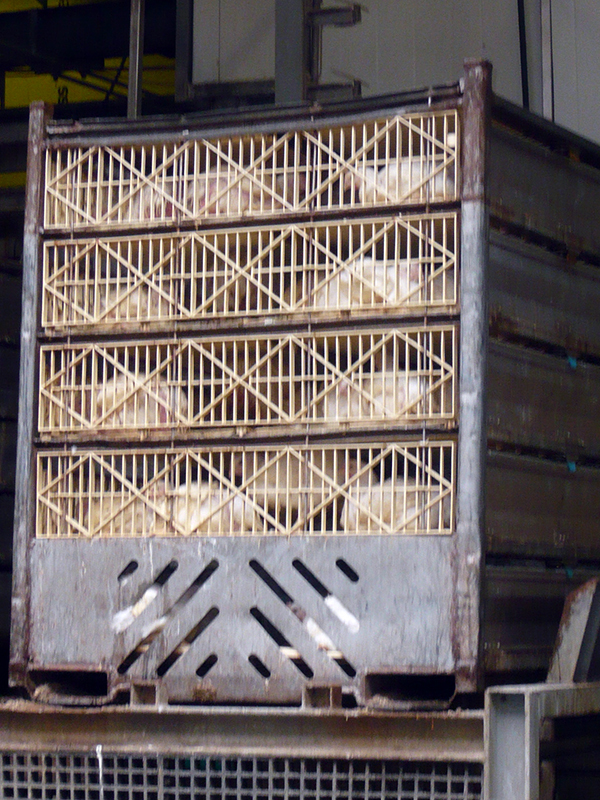 A truck loaded with chickens will travel hours from the many broiler farms around Vancouver and beyond to this chicken processing plant. Earlier we watched one turn off Hastings into Frasier, but it looked empty. While we’re in the alley another, presumably full, pulls in, ready to unload. I’m with the 2×5 crates, the 200 chickens, that have just been loaded onto the heavy duty conveyor belt. Taking pictures. Mary-chris points past it. 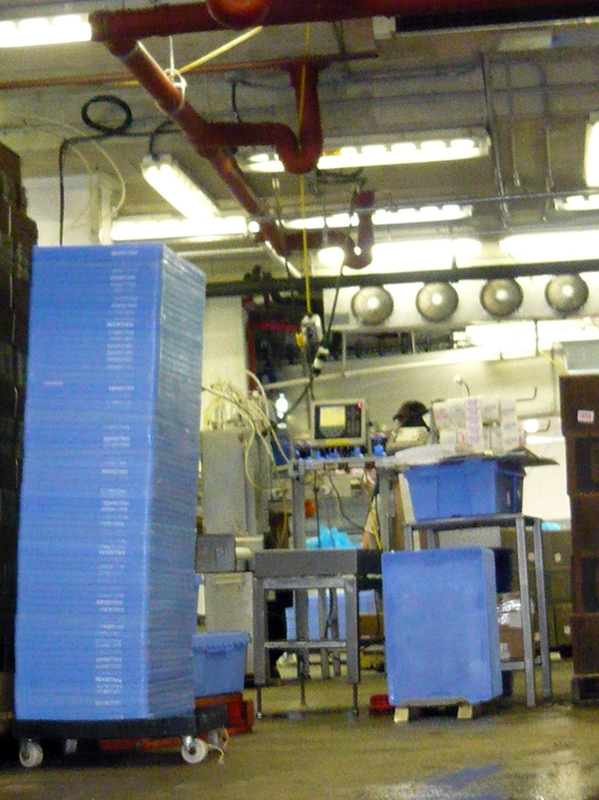 “In a minute that one will tip up 45 degrees and empty them all out into the processing line,” she explains. A moment later that’s what happens. 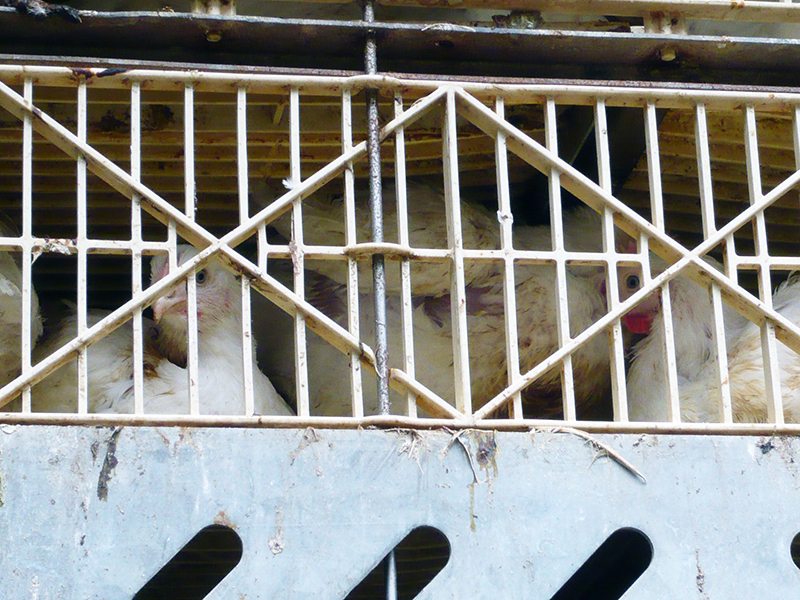 The 200 birds are unceremoniously dumped out of the crate – and disappear from sight. 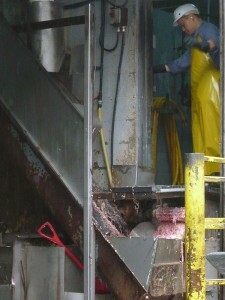 The floor of the conveyor drops, the crate is rolled back and moved out of the way back to the open side of the space, so the forklift can come pick it up and return it to the warehouse, where it can either be repaired, or loaded back onto an empty truck and taken back to the broiler farms, for repacking. The other crates, still full of birds, move one space along in the line. The chickens I have been taking photos of, the ones I have been watching, slip slowly to the side, slip slowly away on the floating, buzzing machine. 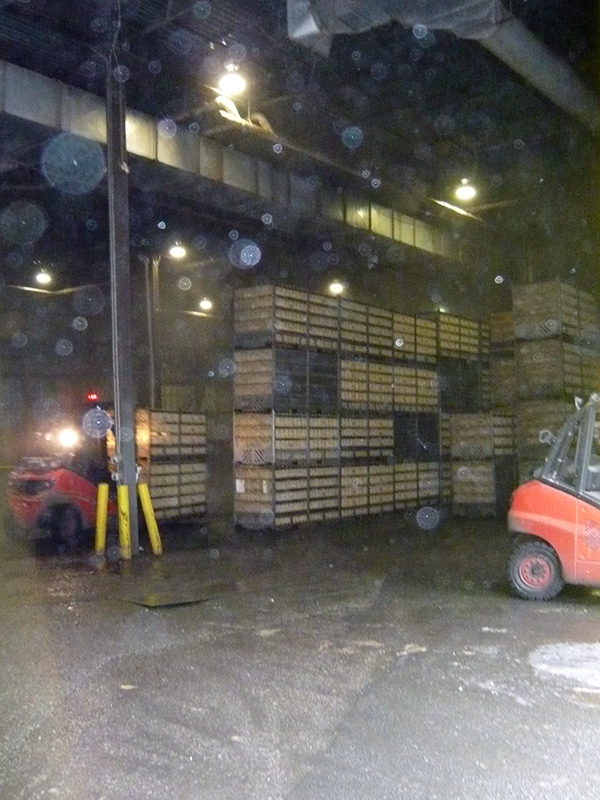 Behind me the forklift driver quickly drives across the lane and loads up another 2×5 in the empty space. The next 200 chickens, to make sure the processing does not stop. If this is the input line, round the corner, where a large refrigerated lorry container is fixed to he building, is the output. And the door adjacent to where we’re standing is in effect the garbage chute. The garage-style door is open and we watch as a huge container is loaded with animal slurry, chicken-flesh pink, pouring down funnels and pipes, some into the container, much of it simply onto the floor. 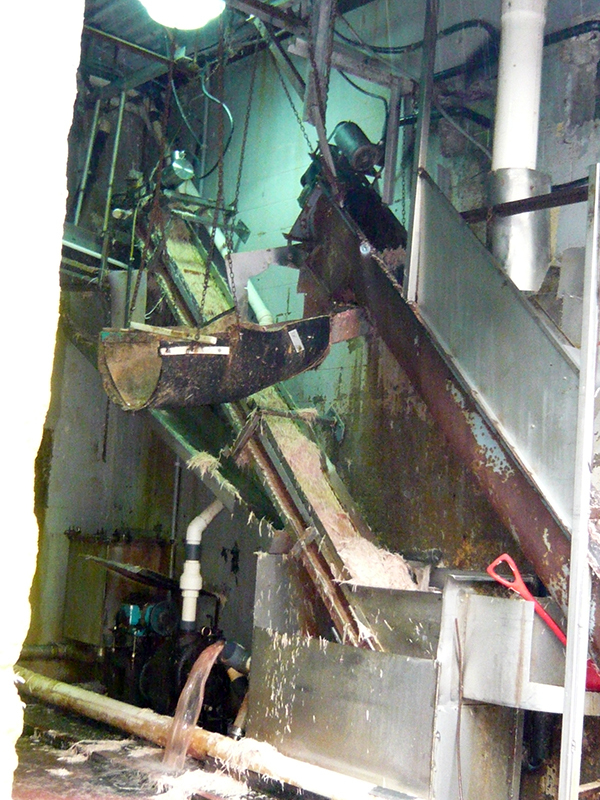 We take videos and photographs until the container is full, the waste products bound for dog food or some other product with standards lower than what is expected for human consumption, and the slaughterhouse worker shuts the roller door, Mary-chris still filming until its fully closed. I wonder why the forklift driver wears a mask but the slurry guy doesn’t. In the lane it smells but not as bad as I’d imagined. The smell is not the worst thing. Even the confusion and fear in the eyes of the chickens is not the worst thing. The worst thing is the mechanisation. The numbers. It’s the first time I’ve seen it up close. I want to cry and I also don’t want to cry. I do not want to seem as if I’m shocked. 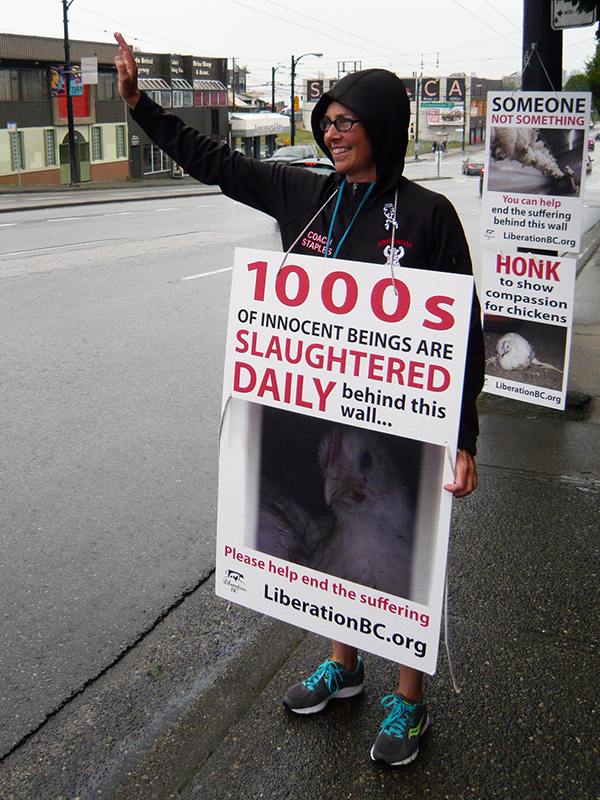 Earlier I’d joined Mary-chris on this regular Friday vigil at the corner of Hastings and Commercial Drive, where every week she and others from Liberation BC and the other animal rights groups in the city meet and bear witness so that others also might not forget what happens behind the walls of this nondescript building, hidden on the slope down to the traffic lights by 12 broad-leaved trees. 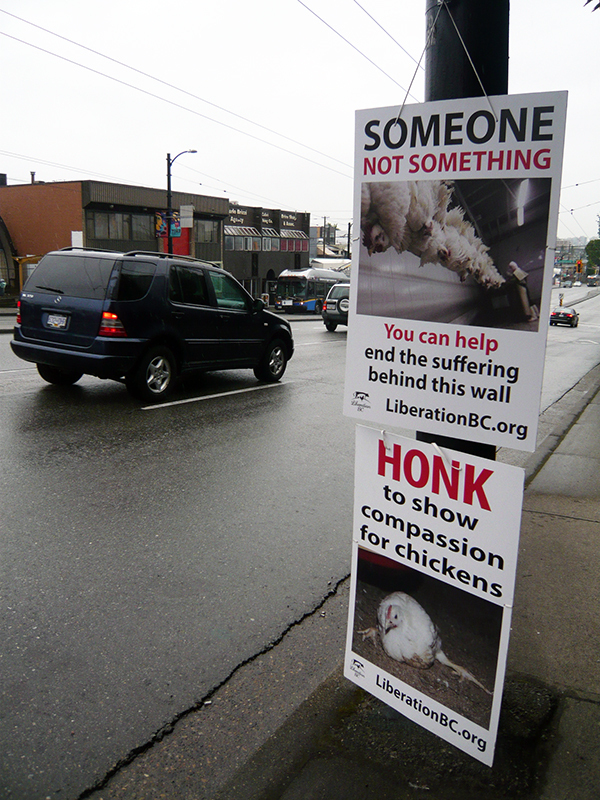 A dozen placards are tied to lampposts and electricity boxes so the commuters on their way to work can see the messages: “Honk to stop the abuse”; a picture of a dog and a chicken with the now well-served slogan “Why love one and not the other?”. This one clearly works. While we’re talking Mary-chris keeps smiling and waving and she gets plenty of people smiling and waving back, and a regular orchestra of honking horns. She tells me about one young boy whose car had stopped at the lights, who read the placard and then whose eyes lifted to the building, and she could see something had happened in his mind. “Even if it’s just one person…” she adds. And then it’s my turn. “Can you hold this while I run to the washroom?” she asks, taking off her placard and handing it to me. Of course, I say. And then she runs up the street, leaving me standing on my own. I’m too self-conscious to wave. But I stand there and I face the traffic. No one honks. I’m not smiling, so no one smiles back. But then a bus driver, who pass by here every day, raises his hand to me, and I think, yes, okay. When Mary-chris gets back she thanks me for doing my bit. It’s nearly 9am now, and Mary-chris is off to join the striking teachers on the picket line, defending Canada’s free education. She tells me that in fact as of today she’s officially retired. She wanted to retire early so she could spend more time on her animal rights work. We collect in the placards from along the street, and load them in the back of her car. The boot is covered with animal stickers, the back seat already down and the car half-full with other posters and the paraphernalia of an activist’s cause. Some of the pictures are of the abuse uncovered in the Mercy for Animals investigation last week at the Chilliwack Cattle Sales. Before Mary-chris heads off to her picket line she gives me a hug and tells me that coming out here in the rain, all the way from the UK, has made her day, already an emotional one, even better. As she drives off I change into my running gear. Landed only last night, I don’t know my way around the public transport, so the best way, anyway, to discover a new place is always to run through it. I’ll leave here and do another 11 miles around the beautiful Stanley Park and English Bay. As I leave I cross the alley again and look up. The forklift is still crossing back and forth, back and forth. The cages empty, full, full, then empty. This is what he will do all day. It is hard labour, and Mary-chris, as with Timothy Pachirat’s book Every 12 Seconds, about his year as a slaughterhouse worker, is at pains to point out, the activists’ vigils and protests are not aimed at the workers, but at the system. As I’m watching two crows swoop down the lane and one dives and picks up a small morsel of escaped chicken flesh. The other crow bombs its back with its talons, hoping to make the first bird drop its prize. And rather than think how awful this is, I’m thinking why don’t people eat crow instead of chicken, or seagull, or eagle—the eagle I saw a few hours later surrounded by crows out at the very tip of Stanley Park. 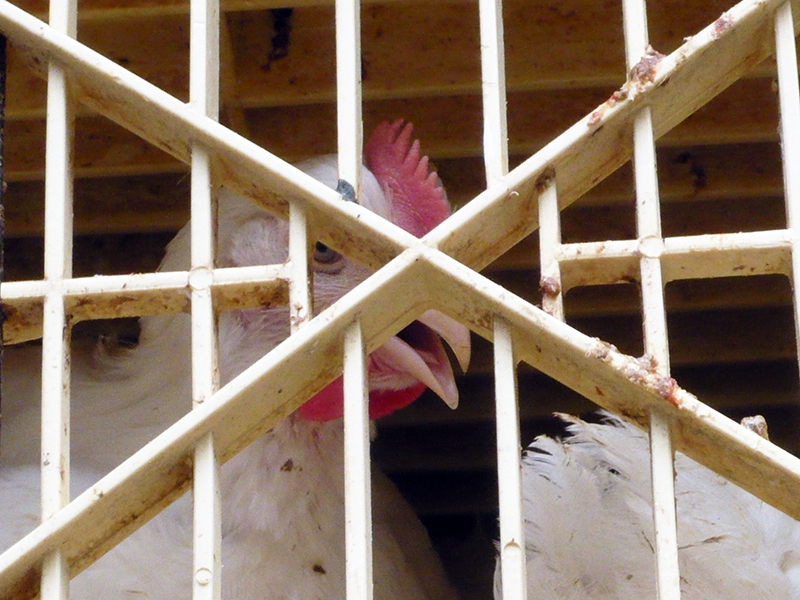 Why is it the chicken—the hundreds of millions of chickens—are the ones who only get to live to be 45 days old?